Where Are The Mr. Hankey Costumes? Haven't given a lot of thought to the kid's Halloween plans yet, but one thing's for sure: she's not gonna have some "top ten" costume. One list on Blogging Baby--"Darth Vader, Batman, the Fantastic Four, Harry Potter, and Dora the Explorer"--reads like the cover stories from the magazines in the dentist's office. 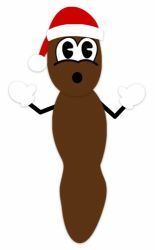 If you feel your kid must have a character costume--and you don't want to cover her in bronzer and use her as part of your own Angelina Jolie get-up--what about Mr. Hankey, The Christmas Poo? A Mr. Hankey costume for an infant would be as easy to make as one of those peapod or red chili pepper costumes ["bunting"? what is that, no leg openings? ], but no. I can't find one anywhere. Why is that? [Normally, this would be the place where I'd point you to some crafty website with costume patterns you can sew yourself. Sorry, not this time. If a homesewn brown fleece poo costume for your kid is actually an option, the sewer [heh] will already know a lot more than I do about where to find an adaptable pattern. Besides, I'm too busy learning how to knit robots. 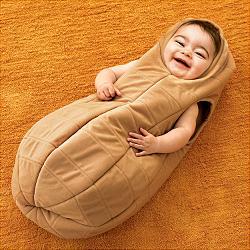 Is the baby peanut costume at redenvelope.com close enough? I would add a link if I had any idea how to do that sort of thing. Greg, while I do like this website and mostly admire your aesthetic, I often wonder after reading one of your posts about what is going to happen when/if your daughter develops preferences and/or obsessions that depart from your carefully chosen and verboten categories in clothing, toys, furniture, et cetera. What will you do if, for example, she somehow falls under the spell of the Disney Princess marketing juggernaut and lives only for that flimsy pink mass-produced stuff??? Rachel, here is your peanut costume. Now, excuse me while I change my underwear from laughing so hard. Thanks PO for brightening my day. And if you don't like the peanut idea you could always tell poeple that your kid is dressed up as a giant sphincter. Where can I get or order that peanut costume? ?